Early Monday morning of last week, I headed out for the second half of my holiday TV tour. One of my first stops was San Antonio, where I always have a great time at the "San Antonio Living" show with fabulous co-host Shelly Miles! If the festive holiday music in the background of this segment doesn't get you into the holiday spirit, I'm not sure what will. You can take a look at the full segment below! But first, fasten your seatbelts - we cover a lot of territory in five minutes here. Every Christmas, Scott and I fly to Tennessee to spend the week with family. After a lunch stop at Martin's BBQ in Nashville, during the two-plus hour drive to his parents' house, we drive by about a zillion Walmart stores. When we are about half an hour away, we always check in with his mom to see if there are any last-minute groceries to pick up. And throughout the week, one of us generally heads to Walmart or Sam's Club every single day to pick up eggs for breakfast casseroles, provisions for dinner for 14, wrapping paper, batteries, or a few last-minute gifts. If you are familiar with New York City, you know that Walmart does not exist there. Having gone to university in Arkansas - the Land of Walmart - I get very excited about these shopping trips. So, I was very happy this holiday season to partner with Gillette, SheaMoisture, and Keurig to share a few holiday gifts and essentials you can pick up in the store. They are sponsoring this post and several of my TV segments. For guys who like gifts they can actually use - which is pretty much every guy in my life - Justice League Gillette Gift Packs are affordable and practical. They are just $9.88 for an entire package that includes a razor, shaving gel, deodorant, and body wash - you pay two to three times that to buy the same items separately. Since there are several designs featuring different characters, a friend of mine bought a different set for each of their teenage sons. For those of us who need a bit of extra effort in fighting dry skin in the rough winter weather, SheaMoisture Holiday Gift Trios feature popular body washes and lotions like 100 percent Virgin Coconut Oil, African Black Soap, or Raw Shea Butter with Frankincense and Myrrh. They also have hair gift trios of their Coconut & Hibiscus or Raw Shea Butter products. Last, but not least, K-Cup pods are a holiday - and for me, everyday - essential. Since my in-laws have a Keurig, we stock up on hot cocoa for the kids, decaf coffee for me, Earl Grey tea for Scott's parents, and plenty of extra bold, dark roast coffee for everyone else. Are you already checking items off your holiday list, or do you tend to be a last-minute holiday shopper? I don't know about your father, but my dad likes gifts that are practical. (Of course, like most dads, he'll tell you not to give him a gift, but that usually doesn't stop me). 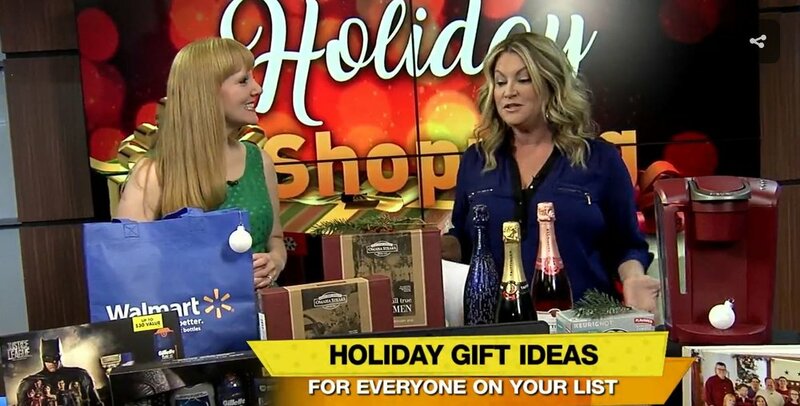 So, I am excited to partner with several companies this year to share fun and practical gift ideas on my Father's Day TV segments! On Mother's Day, we take moms and grandmas out to brunch or lunch. But on Father's Day, the tables are turned, with grilling tools and equipment ranking among the most popular gifts. Instead of taking Dad out to lunch, we send him outside to cook for us! If you do that, why not give him the new Char-Broil Signature Gas Grill? Whether he is experienced on the grill, or wants to cook like a pro on his first time out, this grill makes it easy, so he can relax and spend time with the family while cooking. The adjustable cooking zones let you prepare different things at the same time - perfect for families where everyone likes something different - ensuring that everything gets cooked to juicy perfection. Dad needs something to cook on that grill, like this Father's Day T-Bone Gift Package from Omaha Steaks. It includes a 30-oz. T-bone steak (large enough to share! ), eight ground beef sliders, Omaha Steaks' Signature Seasoning, four gourmet franks, potatoes au gratin, and a creamy New York-style cheesecake. Order by June 13 to use ground shipping. For last-minute gifts (or just dinner tonight! ), check to see if they have a store nearby. Photo courtesy of Omaha Steaks. For something special to drink, you can customize a free wine label for a bottle of Josh Cellars wine that includes his name, a special message, and photo. Buy the wine locally, and go to their web site to create your label. Be sure to opt in to have your label displayed on the Josh Cellars billboard in Times Square, and they will email you a photo of your billboard when it runs! I already did one for Scott; this is what you will see. And - the label and billboard are totally free, as long as you order your label by June 8 (otherwise, you'll have to pay for expedited delivery to get it before Father's Day). How cool is that? Speaking of personalized gifts, this elegant personalized tan leather toiletry bag from Personalization Mall is a stylish and practical way to help him stay organized when on the go. Make sure you order by June 12 to do standard delivery. Photo courtesy of Personalization Mall. Finally, gifts don't get much more practical than this Gillette Fusion Razor. It uses Gillette's advanced 5-blade technology for a close, comfortable shave without irritation (I can recommend this because Scott uses it, and loves it!). This budget-friendly gift also reflects Gillette's lower pricing they announced earlier this year. And since you can pick it up on a trip to Walmart, it's an ideal solution for a last-minute gift. So - how are you celebrating your dad this Father's Day?